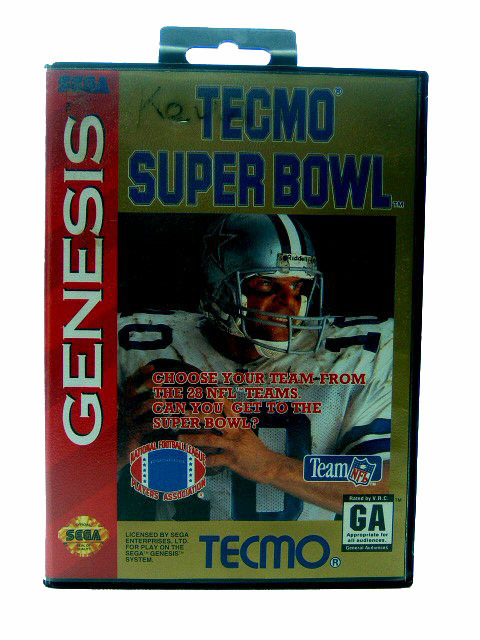 TECMO SUPERBOWL has come to a 32-bit system at last. In this update of the NES classic, you get all of the action you could ever want. Choose from all of the NFL teams, each with complete rosters. If you like to keep all of the team rosters current, you can with the trade feature. Should you disagree with the ratings the player ratings, you can edit them yourself. There are now three difficulty levels and a plethora of camera angles to choose from. In addition to the gameplay changes, the graphics have been improved dramatically. All of the players are larger and more detailed and each stadium has features that are unique to it, including signs from the fans that support the home team. Now you can join the NFL without having to be drafted in TECMO SUPERBOWL. Tecmo Super Bowl marks its debut on the Genesis after enjoying success on the Nintendo Entertainment System (NES). The game features both the NFL and NFLPA licenses, 28 teams, three different schedules (1990-93) with eighteen weeks each, and battery backup to save statistics and standings. For those new to the series, the game uses a horizontal view of the field with a strong emphasis on arcade action. Yet the game doesn't skimp out on team management functions typically found in simulation oriented games. You can customize your playbook, adjust the quarter length in one-minute increments, substitute players who are in poor condition or injured, or choose coach mode which involves just calling the plays.